Tactical Haptics, a company pioneering a novel form of haptic feedback which can create compelling sensations that go far beyond rumble, announced today it has raised $2.2 million to create a development kit of a haptic VR controller as a stepping stone to an eventual consumer product. 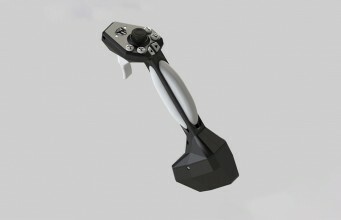 Reactive Grip is a novel method of haptic feedback which uses sliding segments in the handle of a controller to create ‘shear’ forces in your hand which mimic an object moving against your palm, like the handle of a gun when it shoots, or the handle of a sword when it comes in contact with an enemy. The effect is unique and impressively convincing for certain interactions, and in many cases feels more authentic than mere rumble. Tactical Haptics tried to jumpstart their path to creating a Reactive Grip developer kit in an unsuccessful 2013 Kickstarter that raised nearly $90,000, but was unfortunately well short of its $175,000 goal. But that didn’t mean defeat for the company, which has been refining its tech ever since; we’ve seen multiple prototype iterations since that time, including demonstrations tapping into the tracking of the Vive’s controllers and Oculus Touch. 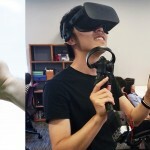 The company plans for the development kit to have cross-platform support between the Rift and Vive, and include its own tracking to function as a replacement for the official VR controllers on those platforms. …our plan for tracking won’t be to mount an entire Vive or Touch controller on our haptic controller. So we plan to have a more integrated solution than what we currently do (which is mount a Vive or Touch controller on our controller). I can say that we are attending the SteamVR tracking partner program training, which will create several options for us to implement tracking. However, the exact implementation of what we do with respect to motion tracking integration will depend on a lot of factors so it’s hard to say more than this at this point. While Oculus has said previously that they planned to open their tracking API up to third parties, Valve is the only one of the two to have done that so far, meaning its more likely that we’d see a development kit that’s compatible with SteamVR Tracking sooner than Rift’s ‘Constellation’ tracking. Whatever form it comes in, we look forward to haptic tech in VR that goes beyond common rumble, and hope that Tactical Haptics’ approach is just the first of many third-party VR controller choices for users. 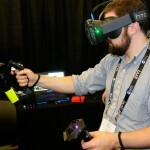 The post Tactical Haptics Raises $2.2 Million to Build Haptic VR Controller Dev Kit appeared first on Road to VR.